SAN JOSE — Nihonmachi Outreach Committee presents the 36th annual San Jose Day of Remembrance on Sunday, Feb. 14, from 5:30 to 7:30 p.m. at San Jose State University’s Morris Daily Auditorium. San Jose Day of Remembrance commemorates the signing of Executive Order 9066 on Feb. 19, 1942, which led to the forced incarceration of 120,000 people of Japanese descent, two-thirds of whom were American citizens. This year’s event will take place at a historically significant venue, SJSU, which played an important role during the forced removal of Japanese Americans from San Jose and major parts of Santa Clara County. On May 24 and 25, 1942, the San Jose State College men’s gymnasium, now renamed Yoshihiro Uchida Hall, served as a registration center that processed 2,847 people of Japanese descent before they were incarcerated. 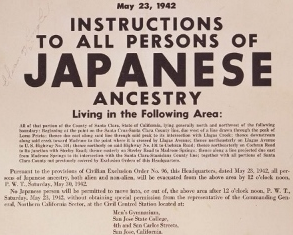 Many Japanese Americans were notified by the above poster that all persons of Japanese ancestry must report to the Civil Control Station located at the men’s gymnasium at San Jose State College, now called Yoshihiro Uchida Hall at San Jose State University. A featured speaker will be Jimi Yamaichi, a prominent leader in the San Jose Japantown community, who will recount his memories of being processed at the gymnasium and forcibly uprooted from his home during those traumatic days. The theme of the 2016 event is “Wartime Hysteria.” In the Civil Liberties Act of 1988, the U.S. government acknowledged that “a great injustice was done to both citizens and permanent resident aliens of Japanese ancestry” and that the acts were “motivated largely by racial prejudice, wartime hysteria, and a failure of political leadership.” The theme warns against the rise of wartime hysteria, as well as racial and religious discrimination, in today’s politically volatile, emotionally charged environment as the nation confronts the issues of war, refugees, and terrorism. Other speakers include Rep. Mike Honda (D-Santa Clara), who was incarcerated at the Amache internment camp in Colorado; Japanese American Museum of San Jose president and SJSU alumna Aggie Idemoto; and other members from the community. The event will also include a performance by the internationally acclaimed San Jose Taiko and a special candlelight procession to Yoshihiro Uchida Hall, where a reception will be held. Day of Remembrance is an event that aims to bring different communities together in order to build trust, respect, and understanding among all people and to renew the pledge to fight for equality, justice, and peace. NOC welcomes a new supporter for the 2016 San Jose Day of Remembrance event: Japanese Chamber of Commerce of Northern California.